E. Dake Plumbing & Heating is proud to serve the Mentor community! About Mentor, OH - Happy to be your hometown Heating & Air Conditioning Contractor! Mentor, Ohio, located in Lake County, is a city noted for its exceptional quality of life and rich history. The city was first settled in 1797 and quickly drew more pioneers that wanted to settle in the area who had heard that the area was plentiful in land and mild in climate. Early in its existence, Mentor was a small farming community, but over the past 200 years, it has grown to a city of more than 50,000. Of the many historical figures that have made their home in Ohio, one of the most notable is President James A. Garfield. He used his home in Mentor as a starting point for his memorable ‘front porch campaign’ which eventually won him the presidency. Today, the James A. Garfield National Historical Site hosts visitors looking to find out information about the way that politics and everyday living happened in the late 19th century. Mentor is settled along the southern shore of Lake Erie and hosts a portion of the lake’s longest natural beach. This area, the Headlands Beach State Park, is a popular place for families and friends to spend time in the peaceful Ohio weather during the spring and summer months. 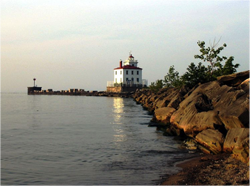 For those that are interested in more than just soaking up the sun, the beach also contains the Fairport Harbor West Breakwater Light, a lighthouse that is situated where the coast and the Grand River meet. The current lighthouse was built in 1925 as a replacement to one that had become too old to continue working, although the current structure still serves as a marine museum. Also available in Mentor are live Civil War re-enactments and other informational programs put on by the Lake County Historical Society and the Western Reserve Model Railroad Museum, which is the largest model train museum in the world. If you are looking for a city with appealing seasons, mid-sized population, and yearlong attractions, Mentor, Ohio may be the right place for you to visit or consider investing in a new home.